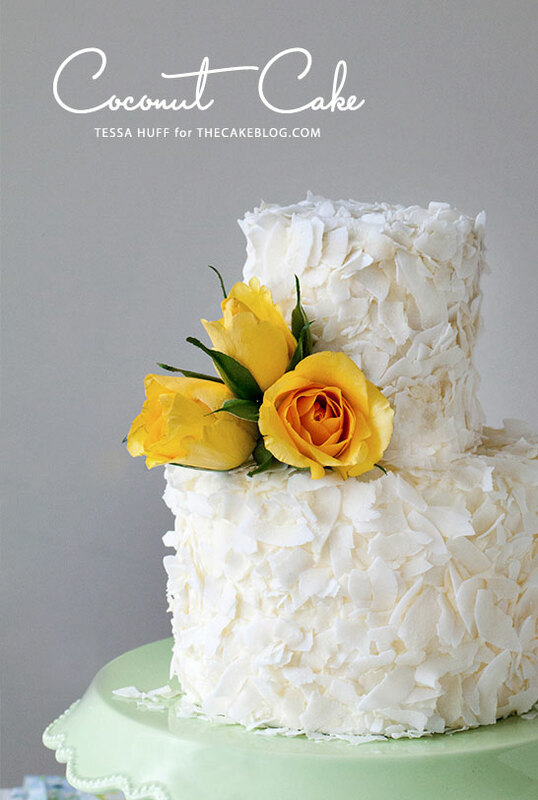 Our contributor, Tessa Huff, is back today with a lovely new cake recipe…. 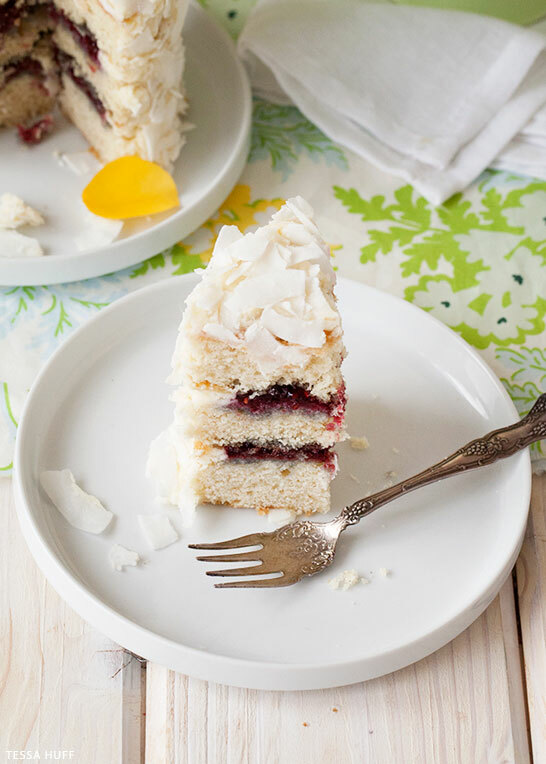 Old-fashion coconut cake is a quintessential Southern treat. There is something nostalgic about a big slice of velvety butter cake and rich cream cheese frosting. The fluffy flakes and creamy flavors are like comfort food, but for dessert. The rustic finish can be dressed-down for a weekday indulgent or dressed-up with fresh florals for a spring shower or Easter celebration. This is the type of cake I can imagine being shared on a sunny patio with sweet tea and great friends. 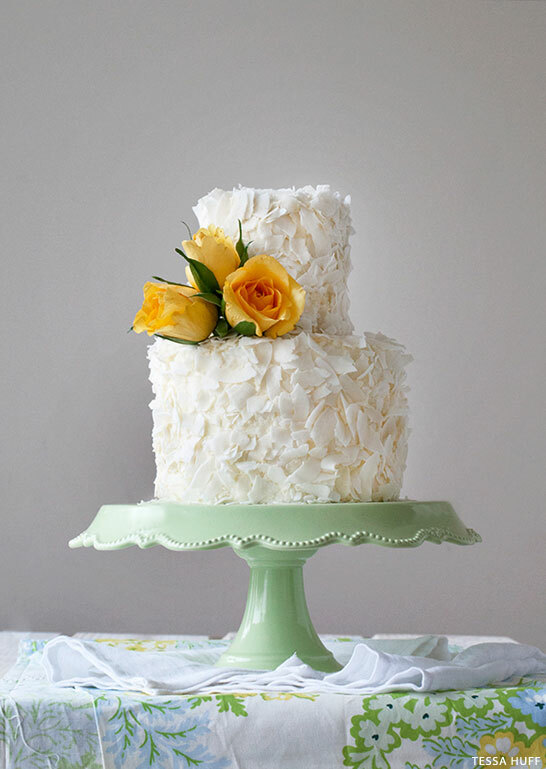 For Spring, I wanted to create a whimsical yet classic coconut cake. 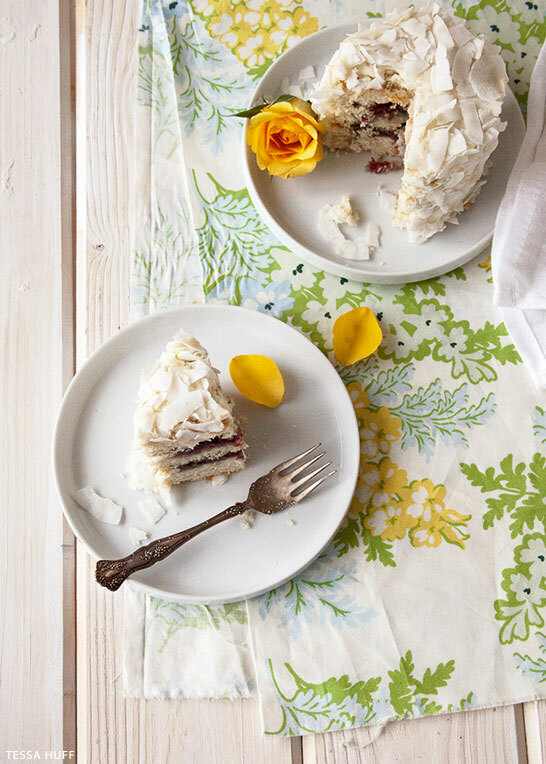 I developed a velvety butter cake made with rich coconut milk and paired with classic coconut cream cheese frosting. The tangy red raspberry filling added just the right amount of sweetness and vibrance to the creamy cake. I chose the largest flakes I could find and left them un-toasted for a light-as-a-feather look. 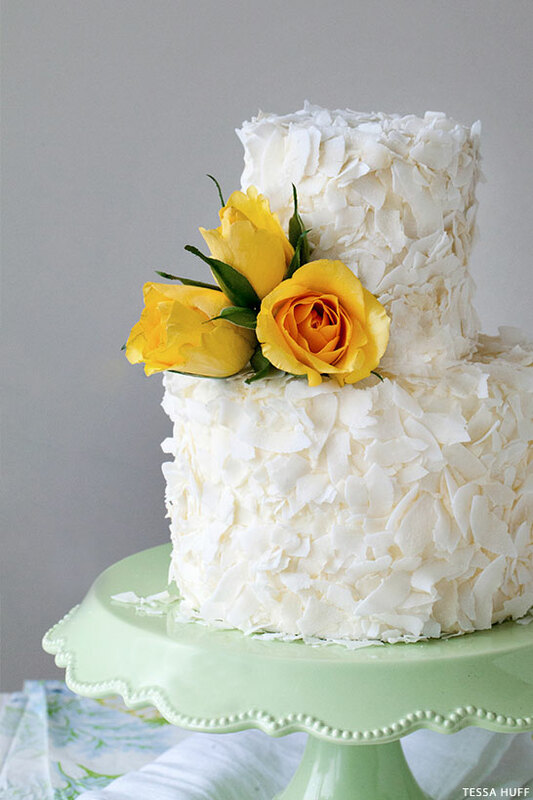 The two-tiers of heavenly flakes make for a gorgeous center piece for any dessert or brunch spread. Preheat oven to 350 degrees. Prepare 3 x 6 inch cake pans and an 8 inch square cake pan and set aside. Place the butter and coconut oil in the bowl of an electric mixer. Beat until combined with a paddle attachment. Add sugar and mix on medium-high until light and fluffy. Turn mixer to medium-low and add in the eggs, egg whites, vanilla bean paste, and coconut extract. In alternating batches, add in the dry ingredients and milks – starting and ending with the dry ingredients. Mix until just combined. Pour batter into prepared pans. Bake until done (about 22-24 minutes). Mix butter and cream cheese with an electric mixer until lightened. Slowly add in the remaining ingredients. Mix on medium speed until creamy. Add more or less sugar and milk until desired consistency. STEP 1 : De-pan cakes from the 6 inch pans. Trim to level. STEP 2 : Run a knife around the edges of the square cake pan and un-mold cake onto a cutting board. Use a 3-4 inch cake ring to cut out three cake layers. STEP 3 : Place cream cheese frosting in a piping bag fitted with a plain, round piping tip. 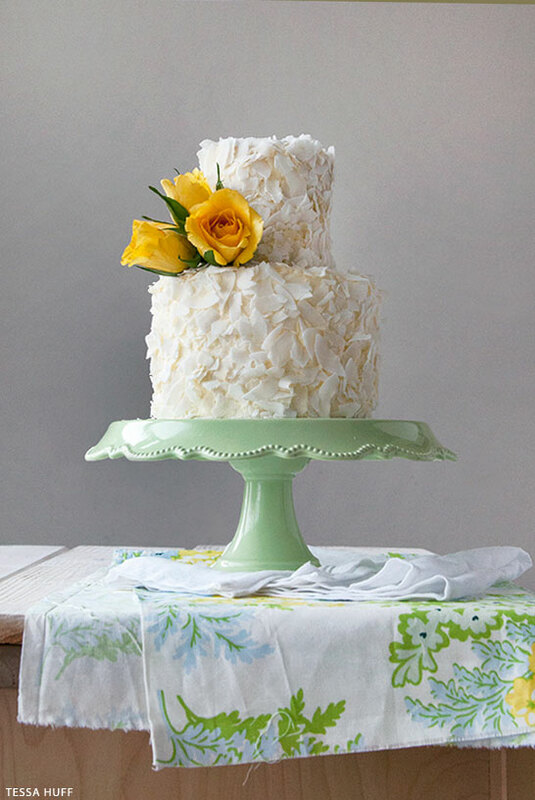 Place a 6 inch round cake on a cake board or cake stand. Pipe a frosting dam around the top edge of the cake. Fill in with the raspberry preserves. Top with second layer of cake and repeat. Ice the 6 inch cake with cream cheese frosting. 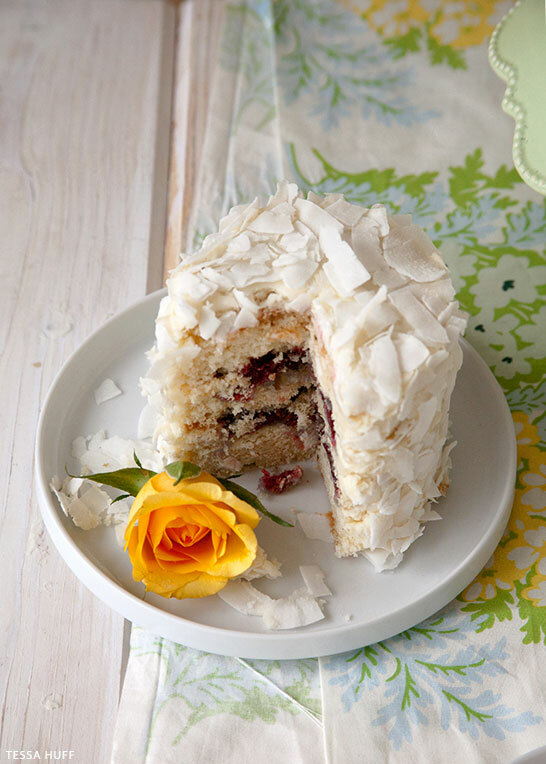 Cover cake with coconut flakes. NOTE: No need to worry about icing the cake perfectly since the sides will be covered with coconut flakes. STEP 4 : Repeat with the mini cake layers. Ice and cover with coconut flakes before carefully transferring cake on to of the 6 inch round cake. Decorate with fresh flowers. NOTE : To serve, remove the top tier with an off-set spatula before slicing. The combination of coconut and raspberry sounds fabulous! What a beautiful cake. Coconut and raspberry? Sounds fabulous! Beautiful cake! This sounds like my kind of cake. I buy roasted coconut as a snack, so I might just use it in place of the other. BTW, I love the plates. I’ve died and gone to heaven! That looks absolutely divine! I made this over the weekend and it was TO DIE FOR. I used lemon curd instead of the raspberry filling, and it paired perfectly together. This recipe is definitely a go to from now on! Why does it ask for an 8inch square pan? Is the one in the picture a 9inch round under the 6inch? The cake is slightly smaller than that. It’s a 6″ base with a 4″ round on top. Tessa has you bake off the cake for the top layer as an 8 inch square. Then in the assembly steps, you use a 4″ round cutter to cut out three layers for the tiny top tier. Hope that helps to clear things up! Beautiful cake! 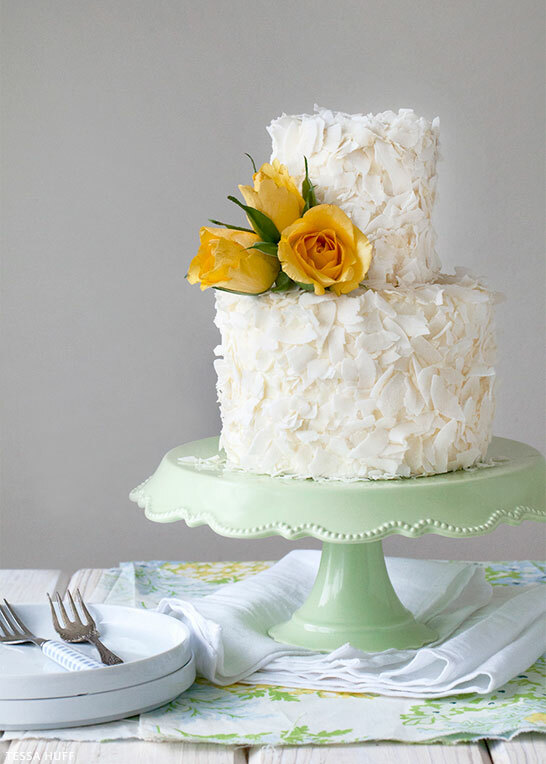 How did you make the large coconut flakes stick so well together? Where can I find large coconut shaving like this instead of the small flakes sold at most stores? For the coconut milk you mean unsweetened from a can..right? I’m sure this is a silly question but I’m quite the novice. are the egg yolks not used n this recipe? If I wanted to make three 9-inch layers… would doubling the recipe be enough or should I triple it? This cake recipe was amazing! I only made the sponge (made using coconut swiss meringue buttercream and pineapple curd filling) and everyone was raving about it the whole time! I doubled the batter to make a two-tier cake with a triple layer each of 8″ and 6″ cakes. By the end of my grandmother’s 80th Birthday party, there was none left and most everyone had a second slice! Thank you for the great recipe! 5 stars!